Most of you would have heard the cliche saying: “the trend is your friend“. If not, well: the trend is your friend! 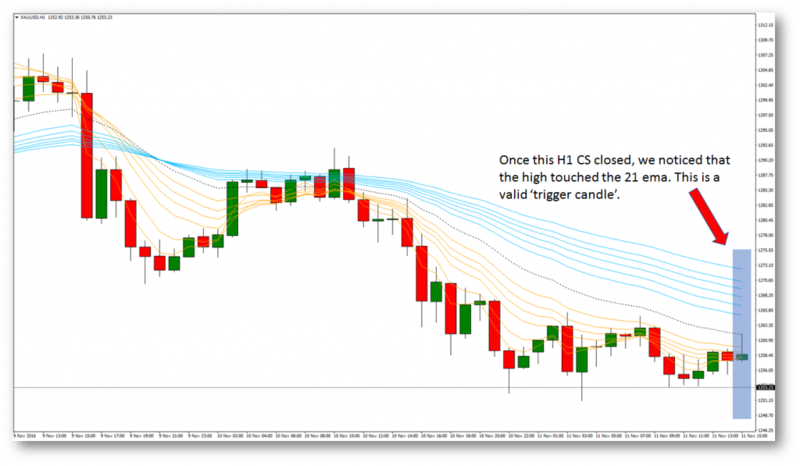 There are a myriad of ways to trade the Forex market and as traders it’s our prerogative to continuously assess how price is behaving in an attempt to exploit recurring patterns. In this article I want to divulge one way you can identify a trend and more importantly trade it for your own. First, lets keep in mind that there are a few ways we can identify trends. I am merely highlighting one way and that’s with the use of exponential moving averages (EMA). 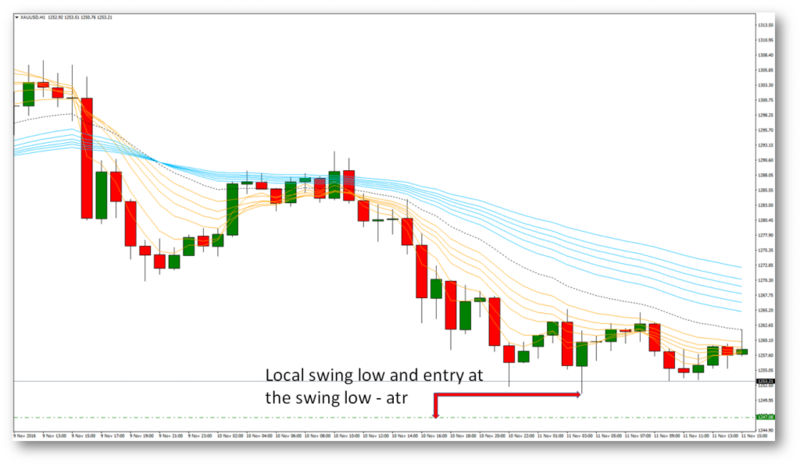 Moving averages are useful to a trader as it can explain additional information about the general behaviour of historical price action. 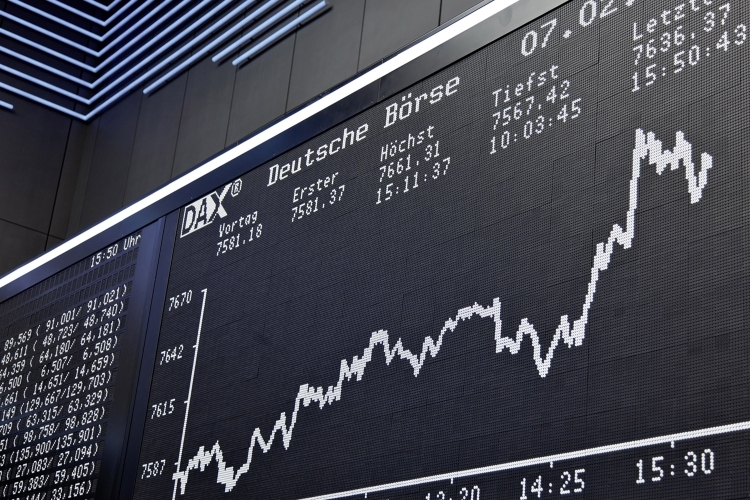 It smooths out price and cuts out the ‘noise’ or fluctuations. If you care to learn more about them, you can do so here. 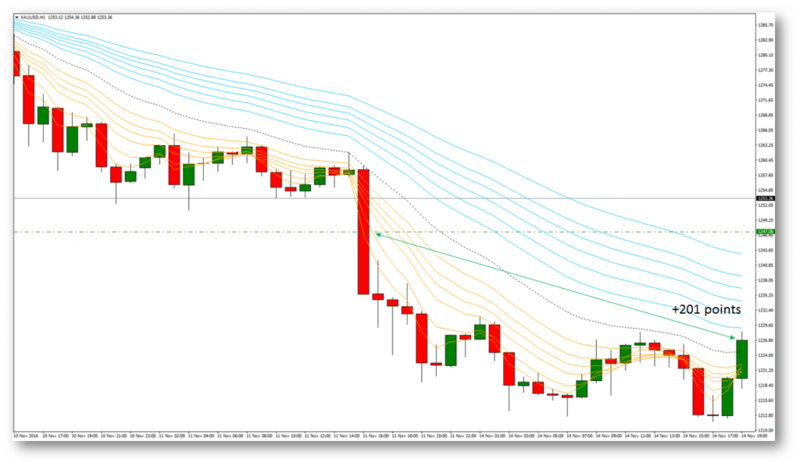 You can get access to moving averages from inside the trading platform Metatrader 4. To do this you go to ‘insert’, ‘indicators’, ‘trend’. It’s quite common for traders to use moving averages but in this case we’re wanting to use a relatively large ensemble of them. We want to see several ‘fast’ and ‘slow’ moving averages to mitigate the odds of a false signal in trend. After all, we don’t want to jump the gun on false positives. How do we know when we’re trending? As traders, we’ve always got to think in a mechanical way. Even though we’re discretionarily trading the trend, we need hard and fast rules to live by. 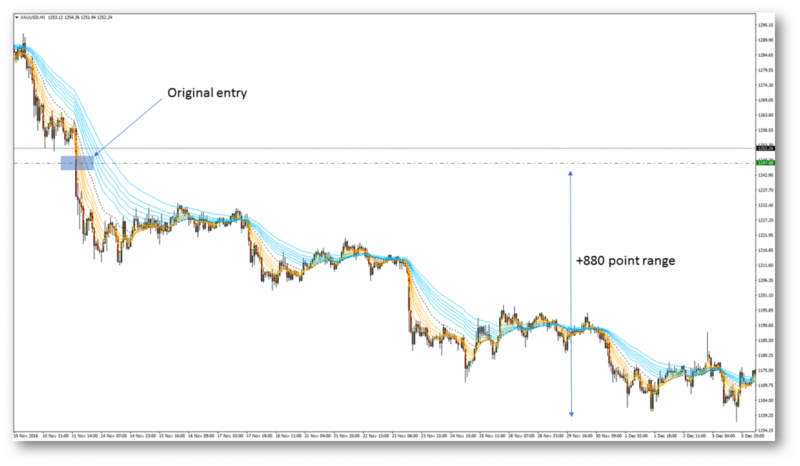 Below is a chart on the H1 timeframe on XAUUSD (GOLD). 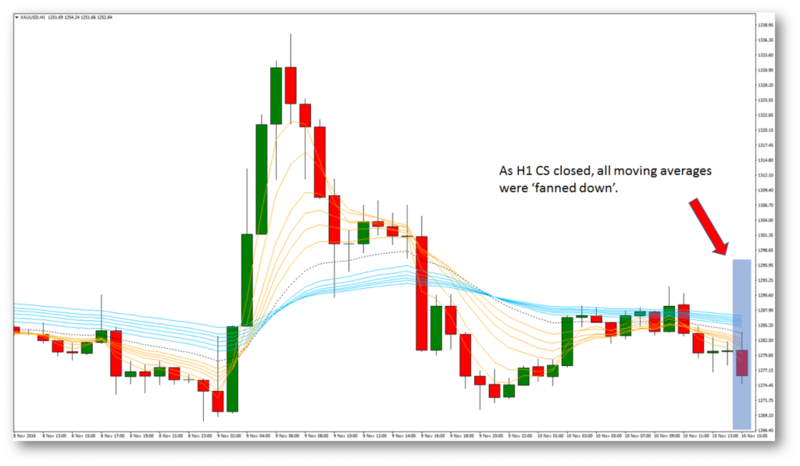 The section highlighted in blue is the point in time (once H1 bar closed) where all moving averages (EMAs outlined above) were fanned down. This means that from top to bottom, the EMA’s were in this order descending order and not overlapped. This point highlighted in blue on the graph above would be referred to as our ‘alert candle’. We’re not quite ready to jump into a trade just yet, but we’re now interested and keeping a close eye for our ‘trigger candle‘. Our intentions are for ‘shorts’ or selling. Continuing from the chart above, at the time this happened we’d now have our eyes peeled for the ‘trigger candle’. A trigger candle cannot also be the alert candle. It cannot touch the 21 ema (black dotted line) and then close beneath the recent swing low. If the trigger candle pierces beneath the local swing low (which is highlighted on the chart above with the red arrow), we would consider this setup as invalid. However, in the case above, this is a textbook example for a play short. As highlighted, we’d want a pending sell-stop at the swing low, minus an ATR value (which stands for ‘Average True Range’). This is our buffer to mitigate potential whipsaw. As you can see, by chance the very next bar triggered us into the sell-stop pending order placed at 1247. Once we’re in a trade setup like this, we need to ride the waves. So, we need to manage what the market gives us. It’s important to note that typically, trend following strategies have a low win rate but when the winners come around, they’re nice and juicy in comparison to the losers. It’s crucial that we give our trades enough breathing room to avoid getting stopped out prematurely. There are a few ways to manage a trending market. In the case above we were looking for the first close above the 21 ema (black dotted line) to partially close some profits. At this point you can then move to break-even with a trailing stop. One way to trail the stop-loss is behind the 60 EMA + a buffer (in the case of a short trade like this). The possibilities for how you manage trades are endless and as a trader you need to work-out what suits you best, based upon your characteristics. This is actually a trade I managed to gain some juicy gains from. However, it shouldn’t go without saying that this is a textbook example. Factor in significant support and resistance levels upon entries, stops and take profits. Most importantly, make sure you test the strategy first in programs like Forex Tester 3. You want to be confident in how it’s done in the past so you can be true to the strategy moving forward when there’s real money on the line.